The UK new market fell by a further 9.3% in July, marking the fourth consecutive monthly fall in registrations. A total of 161,997 new cars hit the road in total, while the Ford Focus snatched the most popular car prize from the Volkswagen Golf. Figures from the Society of Motor Manufacturers and Traders (SMMT) show demand is down across business, fleet and private buyers, with falls of 23.8%, 10.1% and 6.8% respectively. While growing uncertainty surrounding Brexit might be starting to have an effect, the fall in registrations is actually in line with the SMMT’s forecasts following March’s changes to VED. It’s also worth remembering that July and August are traditionally the quieter months for the industry. 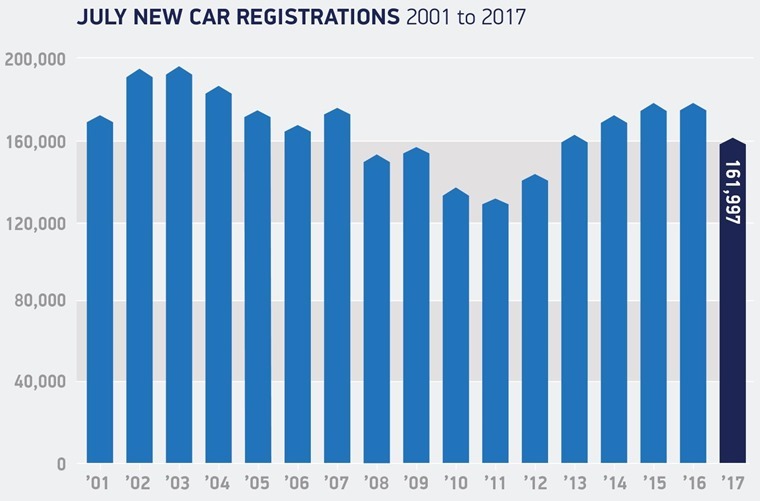 1.56 million cars having been registered in 2017 so far, which means as it stands registrations numbers are currently down by 2.2% year-on-year. 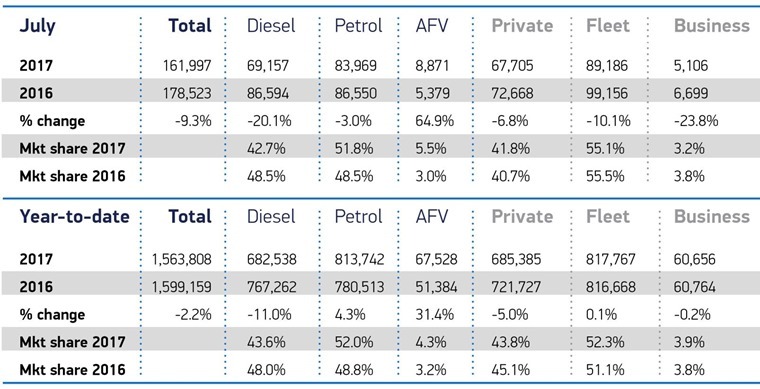 Once again the biggest loser in July was diesel cars, which saw a registration drop of 20.1%, while petrol registrations fell 3%. Demand for alternatively fuelled vehicles however (hybrid, plug-in and electric vehicles) has soared by 64.9% as uncertainty grows about the future of diesel. They now account for a record 5.5% of the new car market, with a further 8,871 hitting the road in July alone. The SMMT points out that months of speculation has added to the fall in diesel’s popularity, even though new Euro 6 diesels should be “valued for their fuel efficiency and lower CO2 emissions”. Meanwhile, Graham Hill, car finance expert at the National Association of Commercial Finance Brokers, has also highlighted the wider issue of the "ongoing negative, and often damagingly incorrect, narrative around car finance - specifically Personal Contract Purchase (PCP) plans" that is "clearly deterring consumers” from new cars. He said: "While there is an issue in how some of these car finance plans have been sold to consumers, the products themselves are robust and responsible routes to car ownership. Last month was the first time the Ford Fiesta missed out on the number one spot for over a year, with the Volkswagen Golf taking the prize instead. 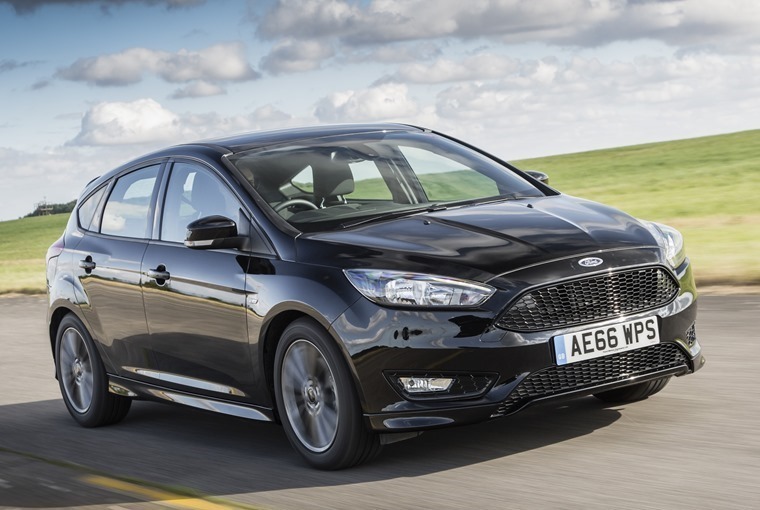 This month it’s the Ford Focus’ turn, while the smaller Fiesta has actually fallen into fourth place, behind the Golf and Qashqai.